Long before human beings began to commit their stories to paper, and the academia distinguished between myths and historical facts, it was said that on one moonlit night in the Salt Range in northwest Bharatvarsha (now Pakistan) the peacocks suddenly fell silent, folded their plumage and huddled together in dismay. In the vicinity sat Lord Shiva, his head bowed, disconsolate at the demise of his consort Sati. At every sigh of his, the bushes shivered. With doleful eyes Shiva looked at the sky. A wisp of cloud floated to shroud the moon. The dense forest then began to echo with music. 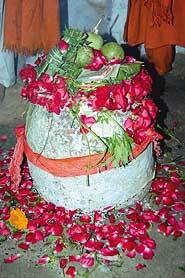 Lord Shiva saw Sati before him. But he did not attempt to reach out to her. He understood she was lost to him forever, that it was a dream born out of deep sadness. Two drops of tears fell from his eyes. Of the two teardrops, Hindus in northwest Bharatvarsha believed, one fell in Katas in the Salt Range; the other in Pushkar, Ajmer. These became two water bodies symbolising Shiva's unfathomable grief. The 19th century British archaeologist, Sir Alexander Cunningham, traced the origin of the word Katas to Katasha, or "the spring of raining eyes." And long before BJP leader L.K. Advani came down to Katasraj, in what was precisely the 58th year from the time Bharat, as also its families and myths and civilisation, was partitioned into India and Pakistan (and Indian and Pakistani), the spot where Lord Shiva had grieved over Sati continued to add to itself new layers of memories and historical conjectures. It was here the Pandavas were supposed have stayed for four of their 14 years in exile; it was here on the banks of Shiva's teary pool that Yudhishthira too passed his greatest test of wisdom to restore to life his dead brothers. From its vicinity in the Salt Range have also been discovered fossils dating to anywhere between 6000 and 7000 BC, axes and tools, and pottery bearing resemblance to those in Harappa. And it was here that Mughal emperor Babar supposedly addressed his troops in 1525 from a stone platform, still preserved as Takhtey Babri. But Katasraj remains Lord Shiva's; the pool of water formed by his teardrop inspiring the Hindus through the centuries to visit the place on pilgrimage. Under the patronage of Hindushahiya kings (650-950 AD), temples began to be built; the oldest here dating to the 7th century AD. Cunningham toured the area extensively in the 19th century and saw numerous shrines and several dharamshalas erected in the distant past as well as in recent times. These constructions over the centuries constitute what is now called the Katasraj complex, spread over 50 acres, and located about 40 km from the city of Chakwal and around two hours drive from Rawalpindi. The complex in main comprises the Satgara temples (six small temples and one central fane), Hari Singh Nalwa's haveli, Bairagi's house and also ancient Buddhist structural remains of the 5th-6th century AD. Incidentally, the legendary Sikh general Sardar Hari Singh Nalwa constructed his haveli, with the facade in red sandstone, above the sacred pool in the early 19th century. The haveli was declared a protected antiquity through a government of India notification on April 12, 1921. The temples themselves were declared protected through a Pakistan government notification in 1956. By then, though, the damage to Katas had already been done. Besides the inevitable ravages of time, Partition and its bloody aftermath form perhaps the principal reason for the state Katas is in. As journalist Ayaz Amir, a resident of Chakwal who frequents the ruins often, says, "It was during Partition that a lot of vandalism took place when the Muslims tried to damage these temples. Over the years the windows, doors, in fact anything people could lay their hands upon were taken away.It lay in ruins as there were no Hindus to either visit or restore it. " Amir says the last time he visited the shrine, he saw painted on a wall an advertisement for sweets: "Mashoor Rewari-Pehlewan Rewari." The hatred Partition spawned only escalated the decline of Katas and other temples in Pakistan. Pakistanis consciously chose to deny their Hindu past; the tendency gathered fresh momentum in the Zia-ul-Haq era, whose regime discouraged even the wearing of saris as the dress was considered a grim reminder of everything Indian and Hindu. And when Advani and his followers demolished the Babri Masjid in Ayodhya, the then prime minister Nawaz Sharif personally took the wheel of a tractor and tried to bring down a temple in Punjab. 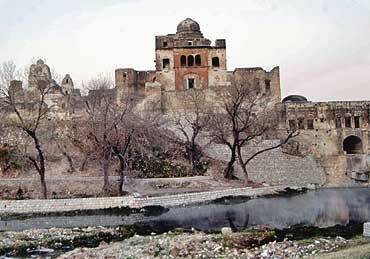 The ruins of Katas could have withered away but for the peace process. With the people-to-people contact gathering incredible momentum over the last two years, and the two states of Punjab rediscovering common cultural bonds, Hindus with a sense of history began trickling into Katasraj. Interest in the ruins were also evinced by the powerful. Shahid Rajput, project director of the Taxila Institute of Asian Culture at the Qaid-e-Azam University, says Indian diplomats would join his 'cultural caravan' which he used to periodically take to the Salt Range. The idea of restoring the Katas complex was mooted by the Evacuee Trust Property Board (ETPB) of Pakistan, which is the custodian of some 1,000 Hindu and Sikh shrines. ETPB's Chaudhry Muhammad Ashraf, a former chief secretary of Azad Kashmir, visited India's Punjab last year and put forth a proposal to rope in Indian archaeologists for restoring Katas. He recently said, "We are keen on collaborating with India to save this architecturally blessed site. It dates back thousands of years and bears no resemblance to any work of temple architecture in India, be it Madurai or Mathura. We are about to propose a World Heritage Site status for Katasraj." He added that former Haryana chief minister Om Prakash Chautala donated money for restoring Katas. 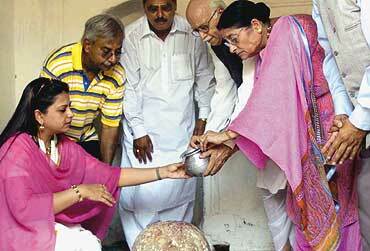 Beyond all such efforts, Katas had been 'rediscovered', and perhaps saved, because of Advani's visit to the ruins. The idea to invite the BJP leader to Katas, says senator Mushahid Hussain, was that of Pakistan Muslim League president Chaudhry Shujjat Hussain and the cultural icon of Lahore, Yusuf Salahuddin, the grandson of poet Allama Iqbal. Says Hussain, "We wanted to send a broader political message to India. Look at the irony of our times: the very man who spearheaded the demolition of the Babri Masjid was invited by Muslims to lay the foundation stone for the restoration of a Hindu temple so that the Muslims of Pakistan could bring back its past glory. While it was the president of the BJP who demolished the Babri mosque, it is the president of the Pakistan Muslim League who is bringing back to life one of the most important religious sites of the Hindus." 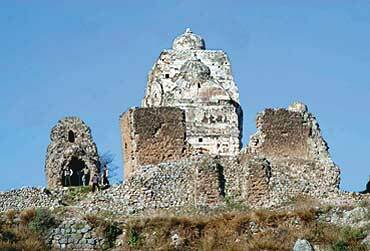 The spotlight on Katas has already inspired Punjab CM Chaudhry Pervaiz Elahi to demand last week that the Katas temples should be transferred from the archaeology department of the federal government to the Punjab government. O. Maqbool Jan, director of archaeology, Punjab, said this could help restore Katas as his department had gathered some experience in restoring one temple there. 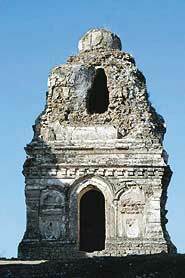 But Jan confesses even his artisans are not familiar with the architectural details of Hindu temples. "We need expertise from India," he said. But Shahid Rajput is pessimistic, claiming that the rudimentary restoration work in Katas is shoddy. "Restoration work in Pakistan is marked by a lack of professionalism. Rules here are too flexible, just about allowing anybody to enter the field of archaeology. If the government is serious about restoring Katas, it should draw out a five-year plan and rope in universities and trained scholars who have knowledge of Hindu art and architecture, besides that of Gandhara and the Indus." Adds Amir, "How do you propose that Pakistanis should reconstruct Katasraj when even the Lahore fort, the Badshahi mosque and the Sheesh Mahal are more an exercise in destruction. Once they drilled huge iron bars into the Sheesh Mahal for staging a social event there." Interestingly, the growing clamour to restore Katas has not been opposed by people, nor by those rabid, right-wing leaders who perceive threats to Islam in even the most innocuous of secular activities. Perhaps their silence reflects the popular support the Indo-Pak peace process has garnered. But then, as Rajput reminds you, temples have always been an unstated part of Pakistan's landscape. He says, "There are dozens of Hindu temples in most cities in Pakistan. We have lived together, Muslims, Sikhs and Hindus. In some of these temples people now live; and some are what you can call practising temples." Conscious of Pakistan's Hindu past, Rajput and others even made a presentation to President Pervez Musharraf, suggesting ways to preserve the country's cultural heritage. But the files pertaining to it are now reportedly collecting more dust than the temples themselves. The optimists, however, hope that all this may soon change. For, Advani's Pakistan visit may have been a political setback for him but it has revived interest in the need to preserve heritage that, during Lord Shiva's times, knew no boundaries.